With over 30 years experience in landscape design and landscape maintenance, All Things Green Landscape Services is proud to serve clients on the Monterey Peninsula and surrounding areas. We bring a high level of professionalism to your landscape project. 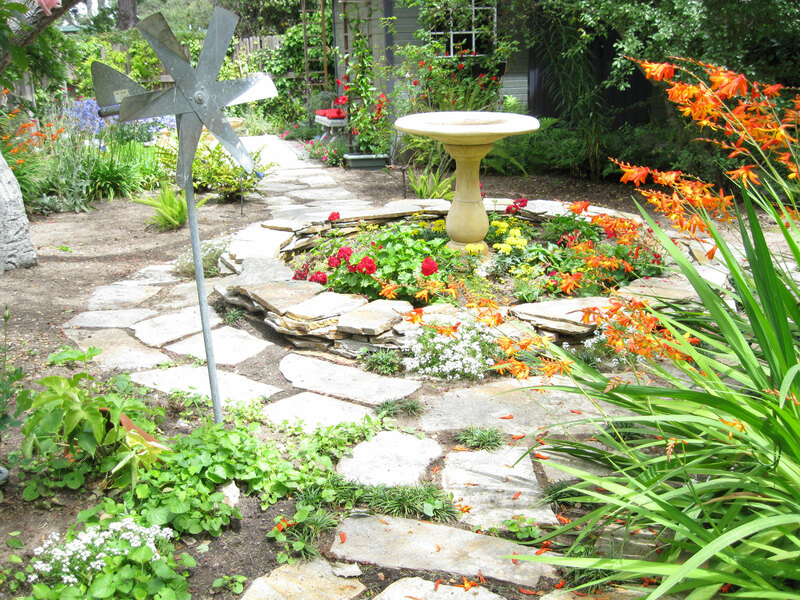 Call us for landscape expertise with Monterey Peninsula gardens. We design and install water-saving, automatic sprinkler and drip irrigation systems, and more! “Many, many years of reliable and trustworthy yard-care for our cottage in Carmel. Several large recent landscape projects also, and all were done professionally and quickly at lower cost than other bids. Richard has provided support for our painting and home maintenance needs thru referrals, etc., also, for many years. I highly recommend All Things Green.” — Jim H.
“Over the past five years, I have relied on Richard to develop and implement a landscaping plan for my 1 acre Carmel Valley property. The plan had to convert over time the existing landscaping to draught-tolerant native plants and do so within a pre-agreed to annual budget. He has consistently met plan goals. In doing so he had to deal with a particularly difficult steep slope erosion problem and the intrusive wild animals. My property was one that other landscapers tried to but could not develop an attractive overall plan. Lastly, his landscaping crew members are polite and cooperative. I could not ask for more.” — Hilman W.
“We would never hesitate to call again. He showed up when he said he would and did what he said he would for the agreed price!” — Dolly S.
“... Congratulations! Your home received a Firewise hazard rating. ... The landscaping is well managed and well-maintained. The combustible vegetation and materials do not pose a significant risk at this time. ... The landscape is very clean and well-designed with fire-resistant well-managed vegetation which should minimize the risk of direct-flame impingement on the attached wood deck and attached wood fence. The owner of the landscape company was present for the wildfire hazard assessment and provided information on the Firewise landscape design for this property.” — Wildfire Defense Systems, Inc.
“I have been enjoying my new back yard this weekend. Thank you again for the wonderful vista.” — Jeannie B. “He did a very good job.” — Barbara E.
“Richard and his crew have been with us for about 8 years. We are very pleased with their work and reliability.” — Thomas M.
“I have been very happy with the service from All Things Green. Highly recommend.” — Karen B.